We are glad to introduce ourselves as one of the market-leading manufacturer, supplier and exporter of UV Treatment System for Water that recycles the sewage water and make it usable for irrigation, washing and various other applications. These plants are now-a-days a great need, saving water is a real concern. These plants recycle sewage water and helps saving purified water to get wasted in washing, cleaning or irrigation. We manufacture these highly useful plants by procuring authentic raw material from reliable sources. These plants are fabricated by our team of expert professionals using latest technology and advanced tools ensuring high efficiency of these plants. We make these plants pass through various quality check process ensuring high reliability at customer's end. Customer can avail these products from us as per their needs & requirements. 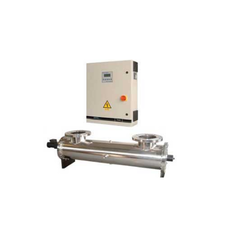 We have gained huge expertise in offering a qualitative assortment of UV Treatment System for Water 3000 LPH. The complete range is fabricated in strict accordance with the international quality standards using premium grade raw material, which is sourced from the coherent vendors of the market. Also, our products are tested on various parameters, before delivering these to our customers end. These UV Treatment System are efficient in destroying all kinds of infectious microbes by directing light to their reproductive mechanism. We are renowned manufacturer supplier and exporter of high grade UV Water Treatment System for Air 2000 LPH, that are used to clean water from all kinds of disease-causing micro-organisms. These systems are highly appreciated for their flawless performance and for not using any kind of harmful chemicals. UV treatment is highly efficient in destroying all kinds of infectious microbes by directing light to their reproductive mechanism. This system is highly reliable and is used world wide in many sectors such as hospitals, hotels, commercial buildings where a healthy life is a priority.